Are you a time-poor or super distracted cook? I often find myself with the intense desire to cook and create something beautiful, but can't find the hours to spend baking and decorating as I would like. 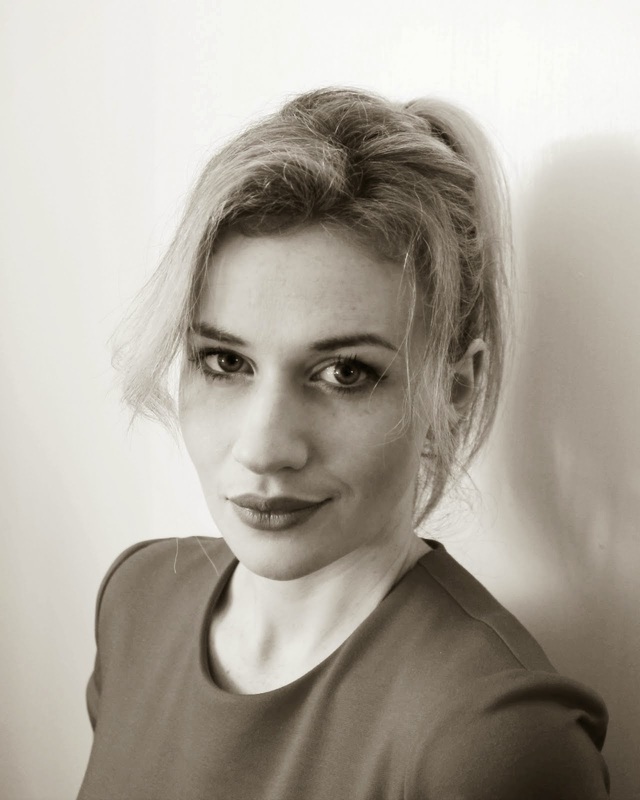 Interruptions in the kitchen don't suit at the best of times, and often I have found myself called away to rescue the baby from our frisky cat Poe, or to change a stinky nappy, or to make an unscheduled feed for a baby who has hit her head and needs comforting. These are major cooking-mojo killers, for often you return to the kitchen to find the bottom of something overcooked, the custard lumpy, or a pot over boiling on the stove. A failed attempt to create something awesome is enough to kill off my cooking passion for weeks. It's ridiculous, I know. But more than anything, I hate failing. You don't have to worry about failing with this delicious sponge cake though. I've made it several times now and I'm almost at the conclusion that it's fail proof and idiot proof. 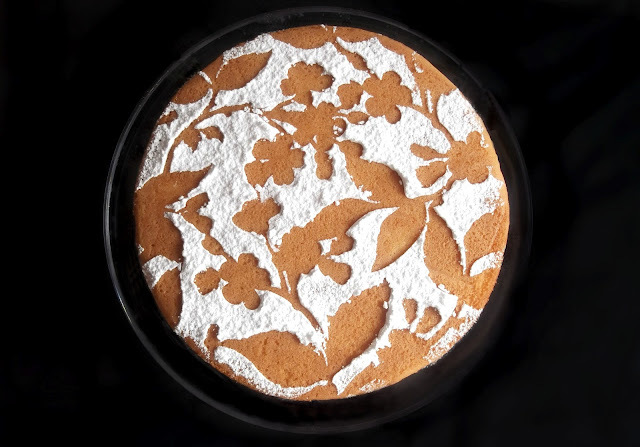 There's really nothing to it skill wise and it's quick and fabulous, and looks particularly impressive with the use of a stencil or doily to help decorate the surface in icing sugar powder. That is also something that takes no skill what so ever, but looks super pretty and detailed without the effort. No longer fear thy sponge! You can assemble it in as little as 5 minutes. In fact, the thing that took me longest concerning this recipe was lining the cake tins. So here's one for time poor cooks or those who cant seem to get 10 minutes straight in the kitchen. It's the perfect recipe to whip up when guests are about to pop over and you find the cupboards bare. So little effort, so little time, and such a winner all around. Grease and line two 20cm cake pans with butter and baking paper. Sift the flour and cornflour into a large bowl, then add sugar, milk, butter, eggs and zest and beat with the electric mixer on high. Beat until light and fluffy, approximately 3 minutes. Fold the baking powder into this mixture. Divide the mixture evenly between the two cake pans. Bake for 18-20 minutes until golden in colour and cooked through when tested with a skewer. Leave to cool in pan for 5 minutes before removing to complete the cooling process on a wire rack. Spread the top of one of the cakes with strawberry jam.Whip cream and spoon onto the top of the jam layer. Top this with the remaining sponge cake. Decorate with a sprinkling of icing powder, and serve. 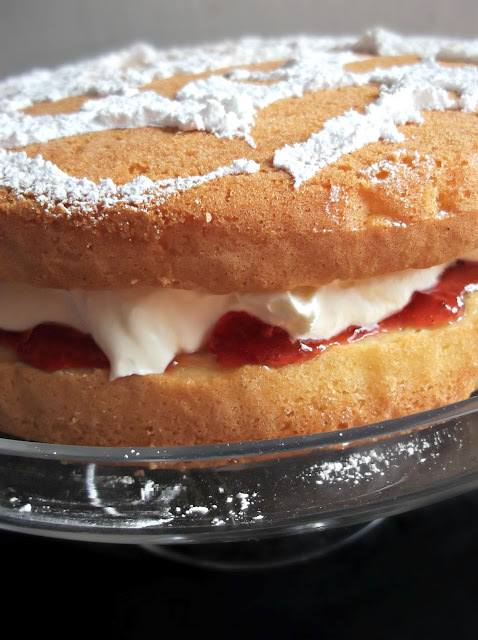 NOTES: This sponge cake is best eaten on the day it is made, for maximum softness. I used a stencil on the top of the cake when decorating with icing sugar for the pictured effect. 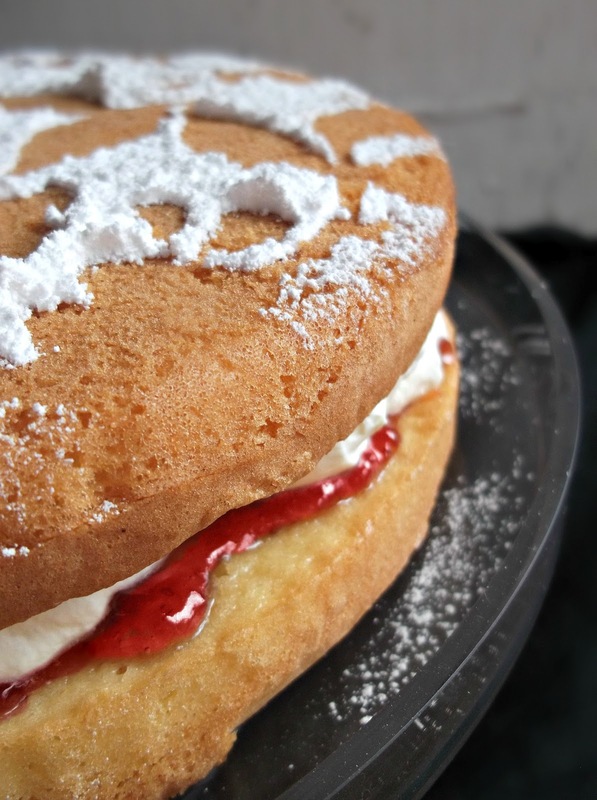 For other serving suggestions and pictures try our individual strawberry cream sponge cakes or our popular easy sponge cakes with fondant roses. thank you Mariana! it certainly was! wow... yummy... i love that stenciling you have done....awesome!! The title of this post is misleading. Adding up all the times in this recipe results in at least 25 minutes, not 5. Plus the time it takes to preheat the oven.